Discussion in 'Pokémon Sword & Shield Discussion' started by DSDark, Oct 19, 2018. The following image is one I found on reddit. 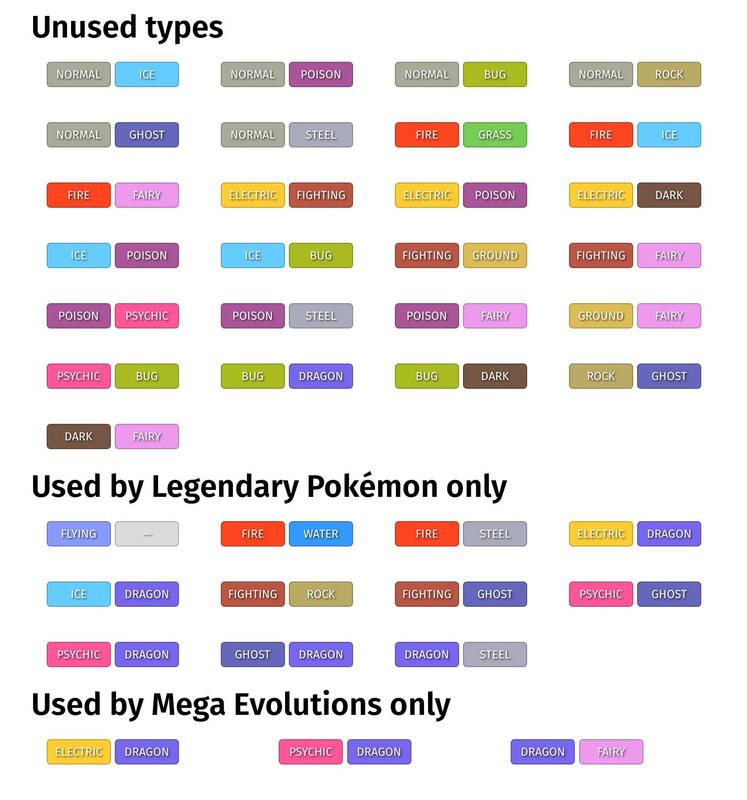 The image outlines of the type combination that have yet to be used or have only been used by megas or legendaries. Which unused type combinations would you like to see in gen 8 and what species of pokemon would they be? WishIhadaManafi5 and Nodame like this. I definitely want to see Psychic/Dragon, Dragon/Fairy, Fire/Fairy and Dark/Fairy, the most. Personally i'm hoping for a Bug/Dragon type. Could base it on Dragonflies. Also I'd like a Fairy/Fighting type mostly on the grounds on encouraging more physical fairy type moves. Fairy Ground, Fairy Fire and Fairy Dragon. Definitely looking forward to more Fairy type combinations. Even though Dragon/Fairy was used for a Mega, I still wish more Pokémon could have had access to it. I'm gonna throw out 2 types that aren't on that list but I feel really should be. Sure both are found on non-legendary/non-mega Pokemon. But the first is found on a Mega and a Regional form, of the final stage of the line. For both it's like a random accessory they are wearing. Sure they have maybe an attack or 2 of that added Dragon type.... but it's not really that new. And nothing they truly own. The relative same could be said about the sole Grass/Electric type, Rotom. It changes from Electric/Ghost to Electric/Grass. And while Pokemon favorite electric lawn mower is my favorite Rotom form..... It's also just so barely /Grass type. It gets 1 Grass move if you choose to let it learn it when it form changes. So yeah I want Grass/Dragon and Grass/Electric. Ideally those types from the get go, but if not make sure they are learning moves of both types and feel like they are actually both types. said a 31 year old married guy who works at a car wash, and has been soft reseting for a shiny mudkip since january 2015. Out of the unused combinations I'd like to see Electric/Fighting and Dark/Fairy. Fairy/Fighting would be very cool. IMO, it's time for another non-dragon pseudo (only got metagross and tyrannitar :|), and I'd like it to use one of the unused type combination. Rock/ghost would be pretty fitting for a pseudo IMO. Imagine being whoever designed Zeraora at GameFreak, and thinking "hey, that Pokémon would make a perfect PURE electric type!" Imagine being the person that designed Zeraora and being told tolime and time and time again, no we don't care what your intent was we think it should be different, therefore you were wrong. That said I'd love to see both Ground/Fighting and Electric/Fighting. A Bug/Psychic based on a moth would be cool. I'd imagine it could look a bit like the Moonlight Butterfly from Dark Souls. Fairy Queen, Trainer Yusuf and Leonhart like this. Fire Ice and Fire Grass are some that I really want to see. Electric Ice too, I know Rotom gets it but Rotom barely gets an Ice movepool, it only gets Blizzard. PokeMon2.0 and Leonhart like this. Be my Mirror, Sword and Shield. Fairy Queen, Missingno.Fan and PokeMon2.0 like this. A Fire/Grass Pokemon in Gen VIII sounds cool. 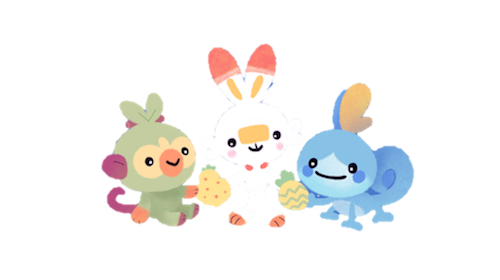 In fact, I'm surprised that Gen VII didn't introduce this type combo given Alola's Hawaiian basis, which would've made sense. Fairy Queen and PokeMon2.0 like this. 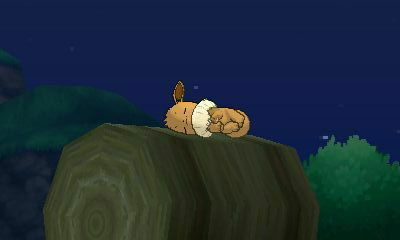 To elaborate on what a Dark/Fairy type could be I imagine some sort of gremlin, goblin, or troll. Something considered evil and mischievous. Fire/Grass, Electric/Fighting, Electric/Dark, and Bug/Dragon are my picks. Fire/Grass is something that you really think should've happened by now, Electric is my favorite type and I'd love to see more of them, and Bug/Dragon is just an interesting combination and it'd be interesting to see how they handle it. PokeMon2.0 and Creyk like this. Grass/Fire and Ice/Fire have always been interesting to me. Since we have Chinchou and Lanturn (water/electric) I feel like we should have had another example of opposite types working together. Maybe based off of a mythical creature known for spreading disease... would be pretty cool to see. Through The Sands We Go: A year after the events of pokemon Sun and Moon, Lillie had returned to Alola to reunite with Elio and begin a new adventure in the Orre region. As the reunion and adventures begin, a crime organization from twelve years ago has made a comeback. Alola Sinnoh : Two months after the third shadow crisis, Lillie has prepared to take Elio on a trip to the Sinnoh region to partake in contests and a surprise trip! What will happen through out their adventure? Of Stars and Boundaries: After receiving invitations to the Pokemon World Tournament on Unova, Elio and Lillie partake in another journey to a region new to them. Will they be able to handle the constant clashes of truth and ideals? Alolan Rescue Team, Exploring the Mind: A week after returning from his adventures in Unova, Elio makes it his personal mission to free Mew from the last of its demons. However, a dark shadow takes hold of them both and now it's up to Lillie, Gladion and Hau to save them!